Big Brother 14 Live Feed Spoilers: Who Won Head Of Household After The Double Eviction? Last night's episode of Big Brother saw two houseguests walking out the door by the end of the episode. Those of you who aren't caught up should consider yourselves spoiler warned! The same applies for those who don't want to know who won the Head of Household competition that followed last night's episode! The following information comes from the the Big Brother live feeds following last night's Big Brother. The houseguests were left to deal with the aftermath of the double-eviction episode that saw Joe and Frank evicted. For the Quack Pack, the night was a success, as two outsiders were sent packing. But Jenn wasn't in the best mood. Even though she knew Frank's eviction was coming, she still seemed disappointed in how things went. It's possible part of that had to do with not winning the Veto during the fast-forward round. We'll have to wait and see what her diary rooms look like on Sunday night. Later last night, before Big Brother After Dark aired on Showtime, the houseguests performed the next Head of Household competition. This wasn't revealed on the feeds, but from what's been said, the competition involved rolling balls and something to do with when things happened in the house over the course of the season. That's a competition we've seen in the past (I think Jerry won that won in Season 10). Ian won the Head of Household, which means he doesn't have to move out of the HoH room. Has there ever been an HoH who's had it two weeks in a row? The Fast-Forward is the only way something like that could happen. As Dan was the HoH between it, but he doesn't get a stay in the private room. 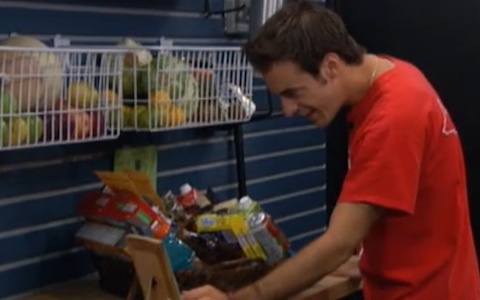 Dan did get an HoH basket though, and some photos of his wife, along with a letter. And he got some new swim trunks, which is likely a major hint that the ones he continues to wear but refuses to wash need to be retired. Something tells me he won't mess with that though. Those grungy old trunks were with him when he won Season 10. Dan also got some Renegades red bandanas, which could come in handy for him and Ian if that secret alliance makes it to the Final 3. As for what's ahead, I'm thinking it could be Jenn and Shane going up on the block. We've seen some whispers from Dan and Ian that suggest that this would be the safest combination with the plan to be to get Jenn out - assuming she doesn't win the Veto. If Ian were to put Dan up - which is still a possibility - Dan would have to worry about Shane convincing Danielle that Dan should go first. Given Danielle's increasingly close with Jenn and the fact that Shane and Dan aren't particularly close, I could see that being a concern for Dan. Ian seems determined that the Quack Pack needs to go to the end. And he and Jenn have never been on the best terms (she'd probably target him first if she won HoH). But I don't know that the other three members feel nearly as strongly as that. I wonder if Shane or Dan will try to push to get the other up and out this week. With only two people voting (and Ian as the tie-breaker), the nominations aren't nearly as important as who wins the Veto. But it will still be interesting to see who Ian puts up and whether there are any pre or post-Veto competition deals made.